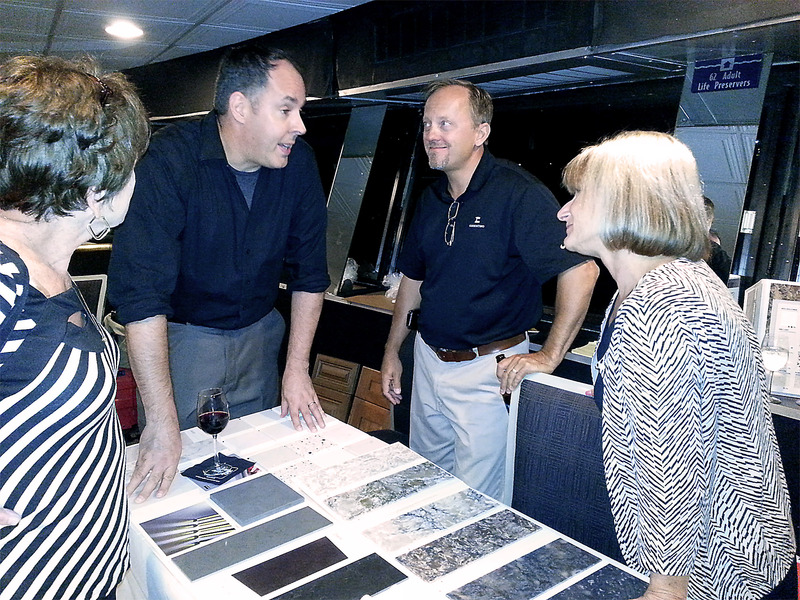 A wide selection of countertop materials is available to choose from, each with its own benefits and limitations. The following is a summary of the countertop options available for your kitchen or bath. Granite – Created from nature and formed by man, granite has fast become a popular choice for kitchen and bathroom countertops with a timeless appeal. Granite is an elegant and beautiful material that has a wide range of colors, patterns and finishes to choose from. It is an extremely hard material that can withstand heat and scratches. A sealer must be applied to granite on an annual basis to protect it from staining, as it is porous and can stain without this protection. Also, the seams in a granite countertop are visible. Most granite is polished prior to fabrication, giving it a shiny finish. 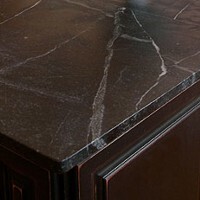 “Honed” granite is also available, providing a more subtle matte finish. Solid Surfaces – Developed by DuPont over 40 years ago, Corian was one of the first solid surfaces created specifically for countertop applications. Today, a number of manufacturers make a comparable nonporous surface, which will not stain and is completely renewable. One of the best attributes of a solid surface countertop is the fact that there are no visible seams and integral sinks are also available. With over 100 colors to choose from, all solid surfaces are accompanied by a manufacturer’s warranty. Quartz Surfaces – One of the newest countertop materials available, quartz surfaces have entered the market within the past decade. This surface is a blend of natural and man-made materials that, like granite, can be fabricated with either a polished or honed finish. Cambria, HanStone, and LG Viatera are a few quartz surface options. Engineered Stone – Considered a “care-free surface,” Engineered Stone is an extremely durable material that is resistant to scratches, chips and stains, as well as being heat-resistant and easy to maintain. With many colors to choose from, you can count on consistency of color throughout your project, though a visible seam will be required when bonding slabs together. Most offer a ten year warranty on the product. Marble – A beautiful natural material with a wide range of colors to choose from, marble offers some unusual patterns and veining. However, since marble tends to be significantly more porous that granite, it is more likely to stain. Laminates – Laminates offer an extraordinarily wide range of colors and patterns to choose from. This affordable countertop choice is being made much stronger and more durable than years ago. It is recommended that you do not place hot objects directly on a laminate countertop or cut directly on the surface, as damage may occur. A laminate surface is non-porous and therefore resistant to bacteria and stains, requiring only soap and water for easy cleaning. Laminates today offer a wide range of design options, some of which don’t look like laminate at all. Wilsonart HD countertops are a great example of this. Other countertop options offered at Kitchen Views include wood in a variety of species and a variety of recycled countertop materials. Click here to see more about the countertops offered by Kitchen Views.